I am happy to say our precious wee baby Smudge is 14 weeks along now and we have managed to survive the first trimester… just. Let us never speak of that time again. 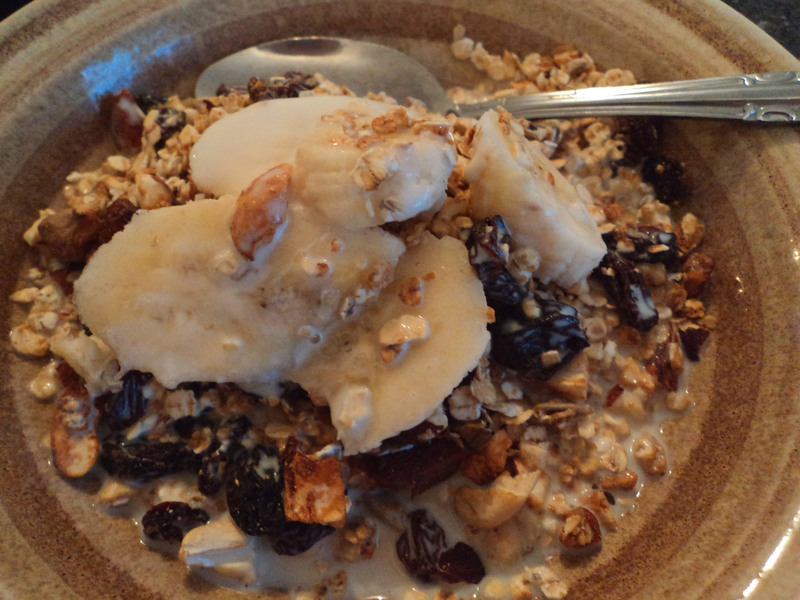 Now I’m craving muesli, this recipe is similar to one my lovely Nana used to make. You can add almost anything you’d like to create a nutritious, delicious, breakfast, lunch or dessert meal. Muesli is good at any time of the day, and a bag of this would usually cost about $9 here, so making it yourself is definitely a more economical option. 1/2 cup of nuts and seeds, crushed. Try pumpkin seeds, sunflower seeds, walnuts, cashews, almonds, hazelnuts – anything! Toss all ingredients (except dried fruit) in a bowl. Distribute evenly on a baking tray. In a pot melt the sweetener (I used treacle) and oil. Drizzle this over the mixture on the tray and “massage” it in. When you’ve achieved an even distribution, bake for about 10 minutes in a hot oven, turning occasionally until you have a uniform, golden hue. Remove from oven, leave to cool, toss dried fruit through and store in an airtight container. Serve with fresh fruit and soy milk.